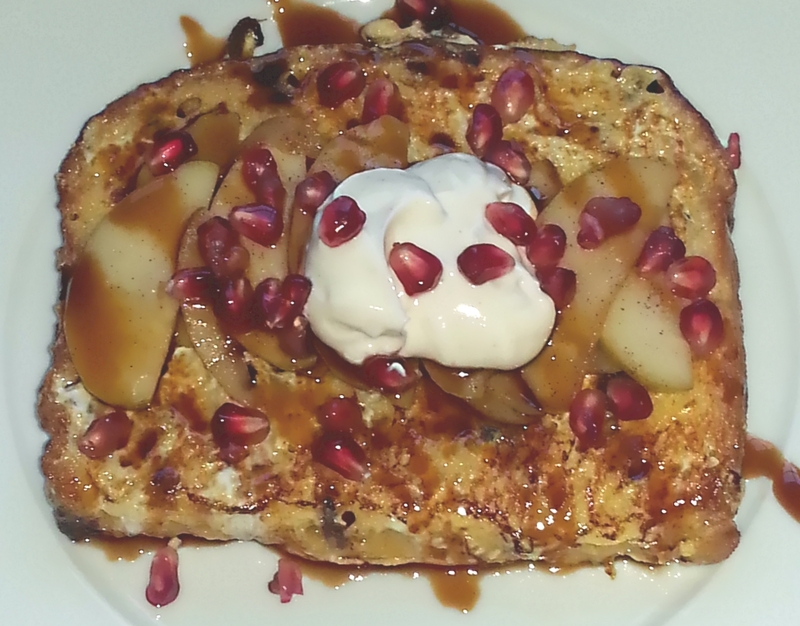 I used sauteed apples, pomegranate molasses, pomegranate seeds, and greek yogurt flavored with honey, vanilla, and cardamom for toppings on this french toast. Pomegranate molasses is a common ingredient in Mediterranean and Middle Eastern cooking. It is essentially a reduction of pomegranate juice with sugar and a bit of lemon. It is a perfect condiment for this french toast. I buy it at my local Mediterranean grocery. You can also find it online. A delicious and decadent holiday breakfast or brunch dish. Heat 1 TBSP of margarine or butter in a non-stick or cast iron pan. Add apples and saute for ~3 minutes, stirring occasionally. Add brown sugar, vanilla, cinnamon, cardamom and salt and cook until apples are softned and beginning to brown, ~ another 3 minutes. Remove apples from pan, add lemon juice, and set aside. In a shallow dish or pie plate, combine eggs, milk, vanilla and brown sugar. Heat 1 TBSP of margarine or butter in pan on medium heat. Dip one slice of pannetone in egg mixture, coating both sides of the bread with egg mixture. Place pannetone slice in pan, and cook for ~3 minutes on each side until browned. Remove slice from pan, place on plate and top with 1/3 apple slices, a drizzle of pomegranate molasses, a dollop of honey-cardamom yogurt and a sprinkle of pomegranate seeds.